Size 44-48 cm / 17,32-18,89 " / Weight 185 gr / 6,53 oz / 6 Cooling vents. Expanded protection zone (twist tightener) / Washable paddings. This is a very small helmet designed for 1-3 year olds. Designed with child comfort and safety in mind. Have you ever tried to buy a cycle helmet small enough for your 1 year old? 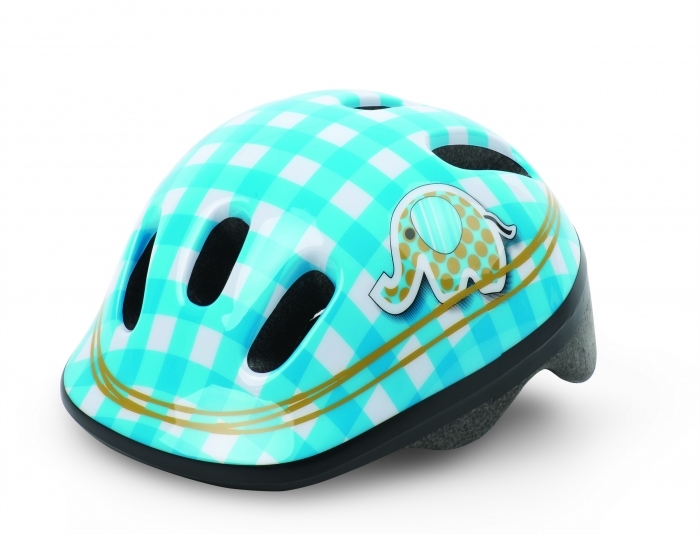 Impossible but now Thudguard introduces ELEPHANT BLUE the XXS size helmet. ELEPHANT BLUE helmets are the best helmets you can buy for your baby. It is recommended that babies must be at least one year old before you try them in a bike trailer or seat. We get many enquiries from parents with babies aged about 6 months to 24 months about when it is safe to put a helmet on the child and take them for a bike ride. The question often reaches us as an enquiry on where to find an extremely small helmet. They were never available until now! They use the twist tightening system to ensure a snug fit at all times as your baby's head grows. These are very high quality helmets MADE IN Europe. Size 44 - 48 cm / 17,32 - 18,89 "
Expanded protection zone (twist tightener) / Washable paddings. Designed with child comfort and safety in mind.